The Blood Service has developed a free resource for anyone involved in antenatal care to improve the detection and management of iron deficiency and anaemia in pregnant women. This follows successful collaboration with three health services, using clinical practice improvement (CPI) methodology towards sustained systemic changes to optimise a woman’s iron and haemoglobin at childbirth. 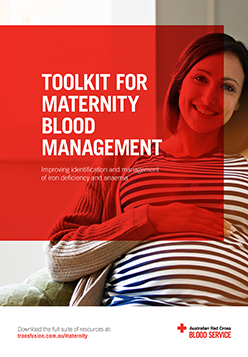 *The Maternity Blood Management Audit is a simplified snapshot audit available online in the Blood Service Audit Tool.